Listening to Music is something most of us enjoy doing everyday. In fact, Americans spend about $14 billion dollars buying Music CD’s each year. 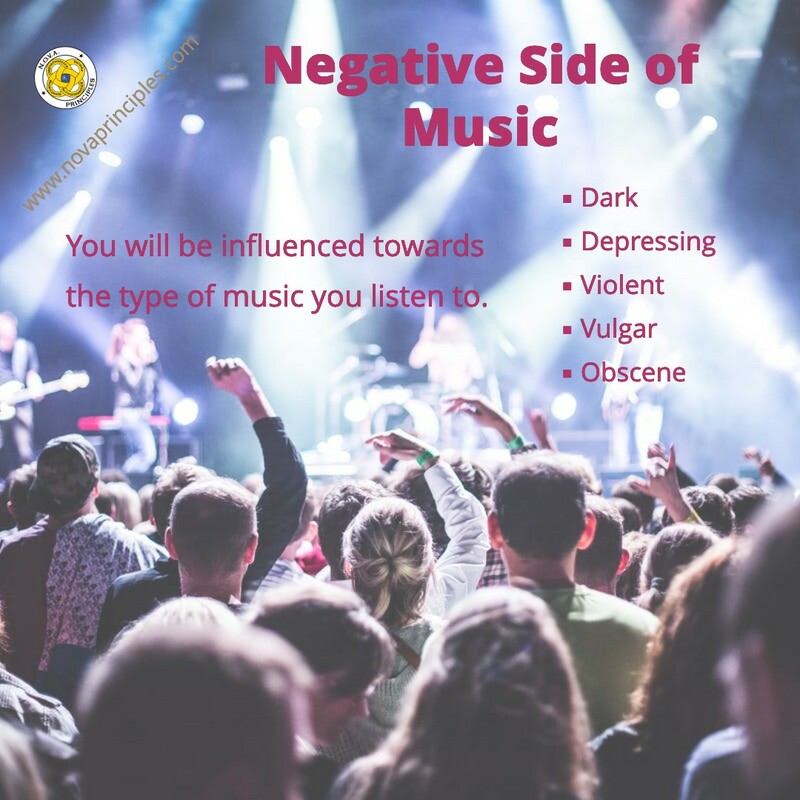 Students are taught that there is a Positive and a Negative side to Music. 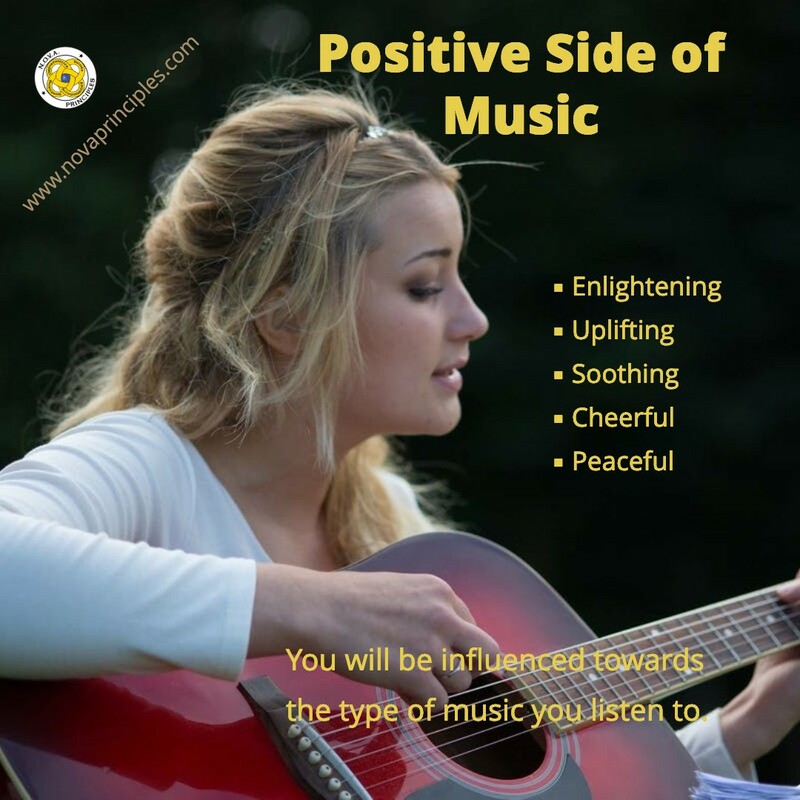 The Positive side of Music is Music that’s enlightening, uplifting, soothing, cheerful, and peaceful. Whereas the Negative side of Music is Music that’s dark, depressing, violent, vulgar, and obscene. 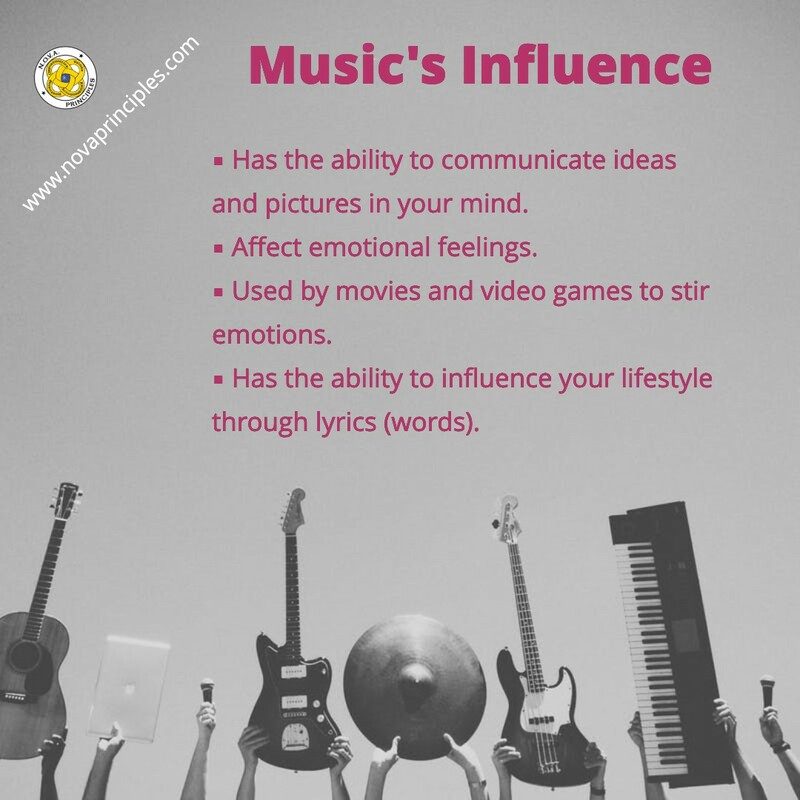 It’s important to understand that that type of Music one listens to, either Positive or Negative, will influence them in that direction. This is why it’s important to listen to Music that’s Positive, enlightening, and uplifting. We are fortunate today, to have had so much wonderful Music passed on to us over the Centuries. However, though there is wonderful and Positive Music that is being created nowadays, it seems that much of the Music that’s being created, is filled with, dark, depressing, violent, vulgar, and obscene lyrics. This Negative side of Music is destructive, offensive, and harmful to all who listen to it and participate in it. To protect and warn children, teens, and parents of harmful and offensive Music, a “Parental Advisory Warning” System has been created. 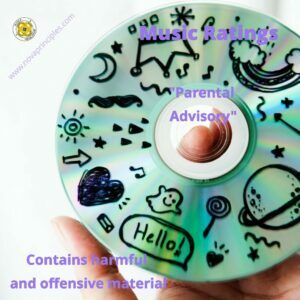 The Parental Advisory Warning System consists of placing a Warning Label on CD’s that are deemed harmful and offensive. This Warning Label is like the R Rating of Music and the M Rating of Video Games. However, the Parental Advisory Warning System is only voluntary. This means a Music CD that contains harmful and offensive Music, may not have a Warning Label on it. Because of this, students are taught that just because a CD doesn’t have a Parental Advisory Warning Label on it, it doesn’t mean that the CD is without harmful and offensive material in it. As such, it is recommended to research a Music CD’s lyrics before listening to or buying that particular CD to avoid consuming harmful and offensive lyrics. 1. Is it Positive and uplifting? 2. What does the band or artist represent and stand for? 3. What is the message behind the lyrics? 4. Do you want dark, depressing, hate-filled, violent, vulgar and obscene Music, to fill your brain? Students are told of a science experiment where a 16 year old boy, named David Merrill, experimented with Music and Mice. David Merrill wanted to know if listening to Heavy Metal Music “Rots your brain”, and if the Music of Mozart “Makes you smarter”. To find out, he took 72 mice and sent them through a maze. He found that on average, the mice made it through the maze in ten minutes. Then he took the mice and divided them into 3 groups of 24. One group was forced to listen to 10 hours of Anthrax (a Heavy Metal group) each day. The second group was forced to listen to 10 hours of Mozart each day. The third group did not listen to any music at all. After a period of 3 weeks, having sent the mice through the maze 3 times a week, the results were amazing. The mice that did not listen to any music improved their average time through the maze to 5 minutes. The mice that listened to Mozart improved their time to 1 ½ minutes. However, the mice that listened to Heavy Metal got worse. Their average time went to 30 minutes. Merrill said that some of them would bump into the walls, and some would just sit there. He said, “It was like the music dulled their senses”. This experiment was Merrill’s 2nd experiment. In his first experiment, the mice that listened to Anthrax killed each other. For his 2nd experiment, Merrill had to keep the mice separate so this wouldn’t happen again. In conclusion, students are encouraged to listen to Music that is enlightening, peaceful, and uplifting as a way to motivate and encourage positive choices and actions, whereas listening to Music that is dark, depressing, violent, vulgar, or obscene does not have a path to excellence. The final N.O.V.A. assignment is given to the students. It’s called the “N.O.V.A. Constitution”. The N.O.V.A. 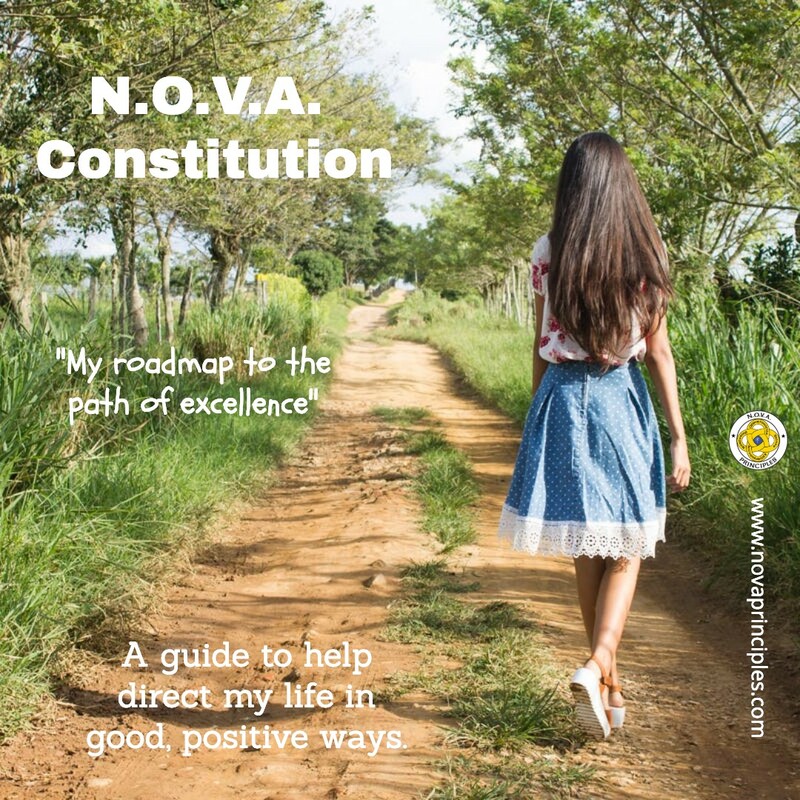 Constitution assignment is a mandatory assignment that students must do if they want to earn a Certification of Achievement Award from the N.O.V.A. Program. Students are given 3 weeks to complete this assignment. 1. Opportunities you want to take advantage of to help you become successful. 2. Things you want to avoid. 4. How the N.O.V.A. program has helped lead you to your path of excellence. Students are to put their first and last name, school and teacher’s name on the top right corner of their paper. N.O.V.A. Constitutions can either be typed with double spacing, or handwritten using blue or black ink pen. N.O.V.A. Constitutions should be about one page long (just one side of a paper). Students should make 2 copies of their constitution, one for their N.O.V.A. Instructor, and one for them.